Whether it is President Trump or the powers that be on Wall Street, the Federal Reserve is taking constant heat over interest rates, its balance sheet, and just about everything else it does. Trump has tweeted many times of his disdain for the Fed’s desire to raise rates and potentially cool the economic growth. He has also questioned Chairman Powell and his abilities to run the ostensibly autonomous branch of the government. So how did we get here? Beginning in late 2008, the Fed began large-scale purchases of assets such as U.S. treasuries and government-supported mortgage-backed securities (MBS) to stave off a complete collapse of the financial system. The program known as quantitative easing (QE) kept interest rates at record low levels in the hope that increased bank lending would spur economic growth. As such, the task now is to address this $4.5 trillion dollar swollen balance sheet. 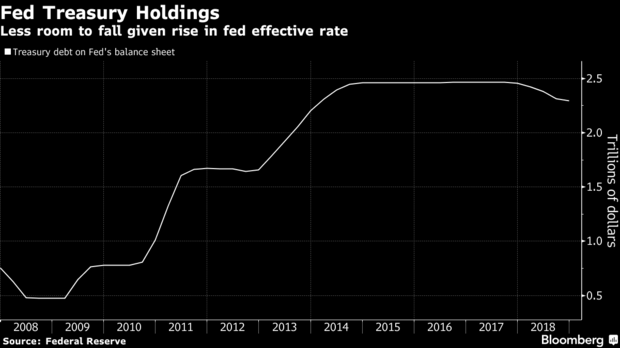 According to weekly data published by the Fed, its balance sheet consists of $2.5 trillion in treasuries and $1.8 trillion in mortgage-backed securities. The heart of the issue is that Fed policymakers feel the need to give themselves options in case the U.S. falls into another recession. If interest rates are close to zero and the Fed’s bond holdings are already massive, the central bank may have very few tools the next time the economy needs help. So what does this mean for the average American? So far, the impact on broader markets has been very mild. Let’s take a look at a few areas of concern. Mortgage Rates: The recent home buying spree has been aided by ultra-low mortgage rates, which are tied to the yields on 10 year Treasury bonds. As the yield on the 10 year Treasury bonds rise, so will mortgage rates. Still historically low, it’s all relative to the current lending climate. Higher rates have the ability to dampen the real estate market. If you’re thinking about buying a home or refinancing your existing mortgage, lock in a great rate when you spot one. Stock Market Volatility: The market placidity of 2017 turned into turmoil in 2018. Fears about rising prices, combined with threats of trade wars, has Wall Street showing extreme volatility at times. As the Fed’s bond trimming continues, investors should prepare for major market swings as we have seen in recent months. Your exposure to the market should be examined with your broker. The young have time to recoup short-term losses, while those in or approaching retirement do not. Economic Growth: We are in the third largest economic expansion in U.S. history, partly fueled by easy monetary policy. One would assume this will not last forever, and the balancing act between economic growth and recession may tip downward as the Fed unwinds. Many economists espouse the deleterious threat of the Fed reducing its balance sheet leading the way toward recession. Michael Cloherty, the head of U.S. interest rate strategy at RBC Capital Markets, is worried. “If the Fed keeps shrinking its balance sheet until it sees signs of stress, the question will be, ‘How ugly is that stress?’ I think it will be quite ugly.” Stay tuned. Will CyberCrime Make the Markets Unstable?